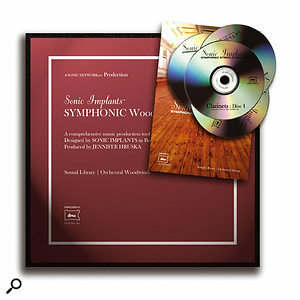 The Complete Symphonic Collection (shipped in the fetching red box in the centre) comprises the previously reviewed Symphonic Brass Collection (left) and Symphonic Strings Collection (right), together with the new Woodwind and Percussion libraries. The addition of woodwind and percussion libraries rounds out Sonic Implants' Complete Symphonic Collection, bringing their three-year symphonic project to a close. The two-year gap between the release of Sonic Implants' Symphonic String Collection (July 2002) and Symphonic Brass Collection (June 2004) might have led some to believe that the latter release marked the end of the company's orchestral library master plan. However, it's now clear that far from resting on their laurels, the Massachusetts-based outfit were hard at work recording woodwind and percussion collections to supplement their strings and brass. The four titles are now released in 24-bit Gigastudio 3 sampler format, available individually or bundled together as the 80GB Complete Symphonic Collection (or CSC). Having recorded their impressive strings samples at the Sonic Temple (a fine classical hall in Roslindale, Massachusetts), Sonic Implants hired the same venue and recording team for their brass, woodwind and percussion libraries. The microphone setup was carefully replicated for each project, ensuring sonic compatibility throughout the entire project. Once again, playing duties were undertaken by musicians from the Boston Pops and Ballet orchestras, with Sonic's Jennifer Hruska overseeing production. 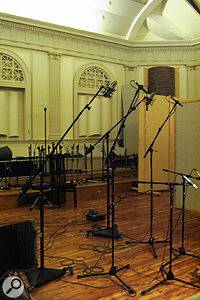 Unlike the East West/Quantum Leap orchestral library and one or two others, CSC doesn't use multiple mic placements to create a choice of listening perspectives; one microphone position is used throughout, with optional release samples tacked on the end of samples to add real-life reverb trails. In the brass, woodwinds and percussion collections, many short notes and hits have three takes, available separately (which is handy for double-and triple-tracking), in key-switchable programs, or in 'round robin' form, where successive strikes of the same key trigger different takes. The strings, brass, woodwinds and percussion each comprise five DVDs packaged in a posh 12-inch cardboard box. Documentation for the complete Gigastudio 3-format set is provided in PDF format only (good for quick searches), with no plans to provide a printed version (bad for bathroom browsers). The manual is very clearly written and crammed full of useful Gigastudio tips, with only one omission: there's no information about the instruments themselves, which may leave some wondering what an 'ocean drum' is, or what 'first chair' means in this context (see me later for the answers!). Depending on your hardware, installing the whole library can take up to four hours. To alleviate the tedium, the makers have created an entertaining slide show which displays on your PC screen when you run each collection's installation program. Alternatively, you can copy the Gigastudio files across manually folder by folder, or even one instrument at a time. In any case, no 'on-line registration wizards' are involved in the process, which is a great relief. As Sonic Implants' Symphonic Strings Collection and Symphonic Brass Collection were reviewed in SOS November 2002 and February 2005 respectively, I'll concentrate hereafter on the new woodwind and percussion collections included in CSC. Since Miroslav Vitous first thought of the idea in 1992, the convention in orchestral libraries has been to record wind instruments in both solo and three-player ensemble formats. Sonic's new 20.6GB woodwinds collection offers 10 types of solo instrument, but then breaks the mould by supplying duos rather than trios (well, you know the saying, "two's company..."). As in the strings and brass collections, the library concentrates on straight multisamples, with no played crescendos or diminuendos, grace notes, chords or phrases. There are, however, plenty of breath noises, flutter-tongue effects and overblown harmonics. All the long notes are looped, which might offend purists but is good news for pad merchants like myself! I have to say right off the bat that some of these woodwinds (see opposite for a complete list) sound absolutely beautiful. The alto flute is a lovely-sounding instrument, and its vibrato legatos sound sweet and lilting right up into the top register. A pair of concert flutes played in unison create a soft breathy texture which works well for both lines and chords, and their short staccatos are precise and well coordinated, excellent for biting, incisive punctuations. The library's solo flute also delivers vibrato sustains with great feeling and control, and there's a cleverly programmed 'extra breath' option designed to increase the attack definition. If you're pining for the old 'three flutes' unison chorale sound, you can simply layer the solo flute over the flute duo (I tried this, and it sounded great). For the first time in a sample library, we hear two piccolos piping away in unison, bright, clear and tuneful. Their so-called glissando samples turn out to be rapid octave runs ending in a short target note, played up and down at five different (unmetered) tempi. The quickest of these works well for exuberant high-end flourishes, but it's a shame that all runs span an entire octave — reducing the interval to a fourth or fifth would have given a more concise and punchy effect. I tried to adjust the sample start to achieve this, but couldn't find a way to do it within the Gigastudio 3 editor. 'Expressive' deliveries with built-in volume swells and heady vibrato can be effective, but if the expression is overdone, it becomes impossible to control the samples in an arrangement. SWC 's pair of oboes manage to be expressive in a subtle way. The first instrument employs a gnat's more vibrato than the second and has a slightly different timbre, but both are capable of sounding poignant and melodic. The same can be said of the English horn, a delightful instrument whose lyrical sound and poised delivery will grace any score. 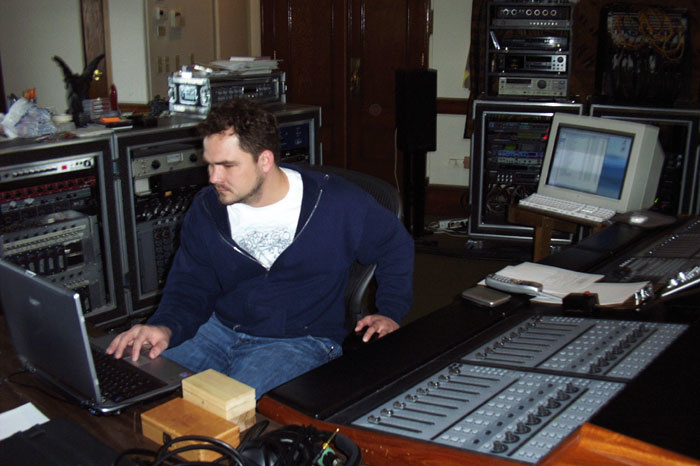 Sonic Implants recording engineer Jason Jordan in the control room at the recording venue for the Complete Symphonic Collection, Futura Productions' Sonic Temple, a beautiful old concert hall in Massachusetts now used for classical recordings. The control room shown here is the former lobby, but has been acoustically treated and kitted out with talkback facilities to the main hall and surround monitoring, not to mention the expensive outboard which can be seen in the background! Recordings for the CSC took place at 24-bit resolution directly into Digidesign's Pro Tools, driven by the large Pro Control visible in the foreground. The clarinet's mercurial delivery and mellifluous tone is difficult to replicate with samples. Here, the instrument fares better than usual, especially in the 'transitional legato' mode (more of which later), which brings to life its fluid quality. In addition to a pair of standard B-flat clarinets, there's a smaller E-flat instrument which plays superbly controlled high notes in a register that the regular model can't reach, plus a fine solo bass clarinet. The latter augments its sumptuous, well-oiled straight deliveries with an excruciating set of free-jazz abstract squeals — nice! As well as turning in a fruity set of conventional performances, the contrabassoon has a nice line in vulgar, low-pitched comedy honks (these amused me so much that I started using them to program funk rhythm patterns, surely the first sign of madness). I was pleased to see an extra dynamic layer utilised to deal with the intense, almost electronic-sounding buzz of the instrument's loudest notes. By way of contrast, the carefully modulated tone and understated vibrato of the two regular bassoons help their unison sustains to 'sit down' nicely in supportive pads, and their ear-catching, colourful staccatos and trills are very well played. The solo bassoon also acquits itself as a subtly expressive melodic instrument, offering the bonus of ascending and descending 140bpm major-scale runs, played in a more measured fashion than the glissandi performances mentioned earlier. All the duos and solo instruments perform their legatos, staccatos and trills at three dynamic levels (p, mf and f), which generally ensures a smooth, natural dynamic response. Most instruments' legato sustains come in a choice of vibrato and no-vibrato styles (contrabassoon and 'second chair' bass clarinet are the only exceptions), and all but the piccolo, contrabassoon and bass clarinet offer a 'transitional legato' option. No marcatos, sforzandos or mid-length portato notes are included. The English horn and bass clarinet play their legato and staccato samples twice in different seating positions, referred to as 'first chair' and 'second chair'. There are no real-life mixed woodwind sections, but someone has done a good job programming a few virtual ensembles — these consist of nicely blended layers of different instruments (mainly duo samples), mapped according to range with the contrabassoon at the bottom end and the piccolos at the top, in a choice of legato, staccato and trill styles. Very useful. Taken as a whole, this is a very strong contingent of woodwinds with no weak areas, an excellent, rich-sounding and highly musical collection which I'd be happy to use in its entirety within an orchestral arrangement. Having admired the effect of Sonic Temple's lively acoustic on strings, brass and woodwinds, I was looking forward to hearing percussion recorded in the same hall. What I heard in this 19.6GB collection was no disappointment (see the box on the right). The timpani (a vital timbre for soundtrack composers) sound beautifully clean, and the hall acoustic adds depth and grandeur. Four different timps were sampled at up to eight dynamics, playing straight hits and rolls in a choice of hard and soft mallets. You can separately access each of the individual timp's three takes; alternatively, 'round robin' programs automatically cycle through them, which is more realistic than hearing the same sample every time. All the timp rolls are played at a steady volume, and no crescendo/diminuendo versions are included, but there are good programmed simulations which use the mod wheel to crossfade between the dynamic layers. In the effects section, the boingy timpani glissando pitch-bends are an amusing comic resource. As well as straight hits ranging from a soft, menacing boom to a hefty great thump, SPC 's bass drum has a staccato category of sharp, accented strikes. Like the timps, the bass drum rolls have mod-wheel crossfade programs designed to simulate crescendos, but in the review copy, these didn't work! 'Whale tones', a set of eerie, haunted-house groans and moans (presumably created by rubbing the drum skin in some devilish way) are an atmospheric sound effect which one would never suspect emanated from a bass drum. Sounding crisp and penetrating, the solo snare drum has been lavishly sampled at up to 10 dynamics, and its large array of hits, flams and various lengths of roll make it easy to program ultra-realistic performances. The loud piatti (crash cymbals) clashes are not quite as triumphal as I would have liked, but by way of compensation, the suspended cymbals perform some glorious mallet swells, perfect for ushering in some soaring theme. Augmenting these orchestral staples are a strong set of four tom-toms, played with attitude and executing some great hits, rolls and more of those spooky 'whale tones', all played in a choice of sticks or mallets. Studying the score to Stravinsky's Rite of Spring recently, I noticed one bar where loud woodwinds, horns and strings are accompanied by a short crescendo roll on the orchestra's tam tam (large gong). Listening to this passage on CD, I found that the gong was so loud it completely obliterated all the other instruments! That overpowering effect is replicated here by some short but deadly tam tam swells, a nice supplement to the more conventional long crescendi. People who enjoy thrusting their heads into the bass bins at rock concerts will find these violent deliveries particularly gratifying. Moving on to tuned percussion, I was glad to see the marimba played with both hard and soft mallets, the latter bringing out its most appealing tonal qualities. This instrument sounds wonderful — the only problem is the occasional obvious change in timbre when switching between its mp and mf samples. The same phenomenon affects the vibraphone; the marked difference in sound between its three dynamic layers, the built-in hall ambience and the absence of the instrument's trademark motor-driven vibrato combine to make it unsuitable for intimate jazz work, though it sounds fine in an orchestral setting. Harder, brighter sounds like the xylophone, glockenspiel and crotales really excite the hall reflections, creating an explosion of high-end energy that sets the ears tingling. The tubular bells also sound very bright and super-clean, but retain the traditional church bell-like quality one associates with the instrument. The large miscellaneous hand percussion section contains attractive bell tree, tambourine and finger cymbals samples, along with dozens of other orchestral and Latin items. Nestling amongst these are some unfamiliar names: the mysterious 'ocean drum' mentioned earlier is a large frame drum filled with (I think) fine gravel, which, when tilted, flows across the drum skin, making a soft swooshing sound like gentle waves on a beach (a 'healing' sound for those in need of psychic refurbishment). 'Knuckleheads' turns out to be a roll played on some kind of high-pitched clicker or rattle, and the 'sizzle strip' (which sounds like a barbecue accessory) is a slithery, crashy metal thing which wins the coveted 'most useless sample' award! Lastly, a few so-called percussion 'ensembles' are merely combinations of instruments segregated into different keyboard zones with no layering. The rather odd pairing of tubular bells and glockenspiel could come in handy in an emergency, but the bass drum/timpani/snare drum combo is likely to prove more useful. Believe it or not, all these samples were apparently performed by one percussionist. Hats off to this talented (unnamed) individual, and let's hope he or she was paid a generous session fee! While programming their symphonic collection for Gigastudio 3, Sonic Implants collaborated with Tascam's development team to develop several new Giga features: Transitional Legato Mode (TLM), the Portamento Reshaping Filter (PRF) and the Dynamic Expressiveness Filter (DEF). Although these names sound like the sort of jargon used by hi-fi manufacturers to hoodwink their customers, they do actually describe processes which produce a desirable musical outcome. The first innovation, TLM, is a monophonic legato mode for woodwinds which aims to smooth out discontinuities between notes by slotting in short transitional samples — I seem to remember the same idea was used in Garritan Orchestral Strings. I found it worked pretty well, give or take the occasional unwanted honk — and fortunately, these can be minimised with a little under-the-bonnet programming! One limitation is that TLM can't be implemented in 'no-release' programs. That's a shame, as the release samples tend to introduce an undesirable blurring effect on fast legato lines. The beautiful interior of the Sonic Temple during the recording sessions for the SBC library. 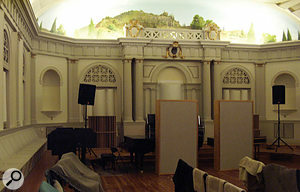 Visible in the lower shot are the studio's lovely Steinway piano (here baffled off from the rest of the room), the monitors used for the talkback from the control room, and (above) some of the Shure, Neumann and B&K mics used on the sessions.PRF (currently available for CSC 's brass and strings only) also works monophonically, and is designed to make portamento glides more natural-sounding by continuously morphing the frequency response of samples as they are pitch-stretched. Finally, DEF allows real-time, mod wheel-controlled morphing between different dynamic layers, a more organic, timbrally accurate and polyphony-conserving approach than existing dynamic crossfade techniques. It sounds very natural, and works well for anything from subtle volume swells to enormous surging crescendos. Although these facilities will probably only be fully appreciated by the technically minded, they demonstrate Sonic Implants' on-going commitment to making their samples more musically convincing, expressive and playable. The availability of affordable high-quality reverbs means that a concert hall recording location is no longer a prerequisite for orchestral libraries — however, it's still an important factor when deciding which one to buy! It's interesting to compare Complete Symphonic Collection 's room acoustic with that of two other leading libraries, Vienna Symphonic Library and East West's Symphonic Orchestra. 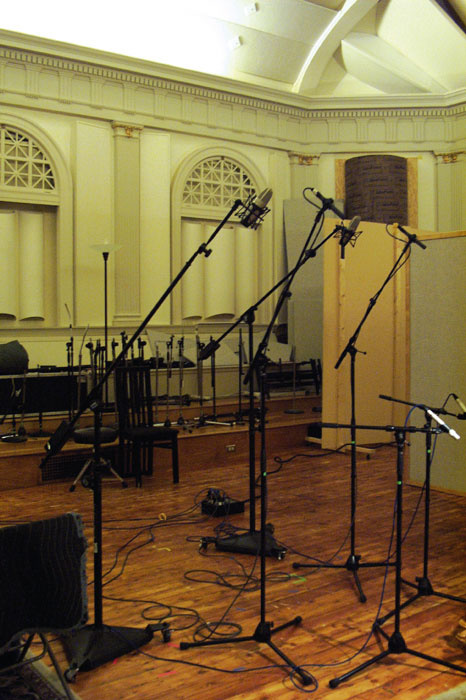 The Viennese purpose-built 'Silent Stage' recording environment has a controlled, studio-like acoustic which faithfully replicates tiny sonic detail and musical nuance. Recorded in a large US concert hall, Symphonic Orchestra generally sounds far more reverberant, though the amount of reverb in the sound varies depending on which mic position you choose. In acoustic terms, CSC 's hall reverb (which I estimate lasts around 1.3 seconds) places it a lot closer to East West's library than VSL's, but Symphonic Orchestra 's reverb is noticeably longer. Sonic's new woodwind and percussion collections uphold the high standard set by their strings and brass. As you'd expect from a company whose motto is 'get a great recording and leave it alone', the presentation is naturalistic, but the programming savoir faire born of years of experience has fashioned the basic samples into instantly playable instruments which busy composers will welcome. The only significant instrument missing from the CSC library at the time of review was a harp, but by the time this article was going to press, a further collection had been released to make good this omission (see page 177). CSC has to be considered one of the leading titles in its field, and is surely destined to join the ranks of VSL and East West's libraries as a professional composer's production tool. I have no hesitation in recommending it to anyone looking for a high-quality, highly musical orchestral sound library. A beautiful-sounding collection of instruments, superbly played by top professionals. Totally compatible with Sonic Implants' strings and brass collections. No played slides, crescendos/diminuendos or grace notes. Great sound — the lively room acoustic really suits percussion! Recorded in the same hall as Sonic's strings, brass and woodwind collections. Generous instrumentation, combining orchestral and Latin instruments with some exotica. Many instruments incorporate extensive samples at different dynamics for greater realism. Few instruments play crescendo rolls. If you need a professional-quality orchestral percussion library, you'd be daft not to check this one out! Symphonic Woodwinds Collection, £546.70; Symphonic Percussion Collection, £380; Symphonic String Collection, £546.70; Symphonic Brass Collection, £546.70; Complete Symphonic Collection, £1645. Prices include VAT.